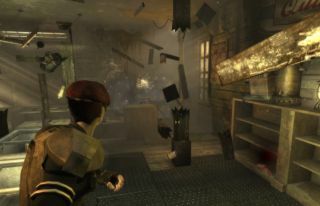 There are plenty of ways to be a jerk in Fallout: New Vegas, but now you can add destruction of property to the list with a mod called Destruction Overhaul. While you can't, for obvious reasons, flatten actual buildings, you can go to town on their interiors, destroying shelves, blowing up furniture, knocking containers around, and smashing pillars into firewood. Outside, you can destroy fences, knock boards off windows, and smash crates into tinder. I gave it a try in Goodsprings, where I'm idolized, or at least I was until I tore through the place like the Tasmanian Devil. In the general store, under the watchful gaze of proprietor Chet, I pulled out my gun and put some lead on the store's load-bearing pillars. Blammo! You can blast chunks right out of them. That's sure to make interior gunfights a bit more cinematic. Right, Chet? Chet? Next, I chucked a grenade behind the counter. Everything in the area went kablooie, filling the air with shrapnel that rebounded off the walls and into my face. The cash register was destroyed, the boards across the windows came loose and flew here and there, and the toolbox, typically a container you can open and close, but not move, was flung across the room. Other containers like boxes and crates can also be dislodged, either by explosions or by picking them up and tossing them around. The innards aren't disturbed, though, so they still function, provided you can find where they landed. Leaving Chet to silently mull over the detritus of his once-proud consumer goods concern, I went outside and lobbed a 'nade at a nearby giant box-thing sitting in the street. It split apart and fell over into a pile of planks. Finally, I'm having a real impact on this world, and that impact is to make it even more of a broken mess. Next, I introduced Goodsprings to a little program called Brahmin Without Borders by going ape all over the town's fences. I admit, knocking over a fence both feels a bit petty and isn't terribly exciting to watch. But still, you can knock' em over. It will add a little spice to fights, I think, when the environment you're fighting in takes damage just like the combatants do. A good example of this happend immediately, when I damaged a brahmin and a Goodsprings citizen opened fire on me. Not only did I get to watch his body fly through the air, and watch his leg fly through the air next to his body, but I got to watch the fence he was standing behind get blasted to pieces, too! It was a good day. Something important to remember: this ain't GTA. The next time you swing back around to Goodsprings or some other unfortunate town you've trashed, the place won't be all neat and tidy and un-exploded as if a team of elves had swept in and dusted the place with magical fix-it sprinkles. You wreck a joint, it stays wrecked, forever, which is why Doc Mitchell is gonna have to find a new place to store his books. There's not a bookcase left standing in his entire house. You're welcome! As you might expect when you wreck things, it creates a lot of additional clutter in the world, meaning you might get a bit of a performance hit. You'll also need all the F:NV DLC to install this mod. You can find the Desturction Overhaul mod right here.